Butter the bread slices on 1 side with butter and place them butter side down. 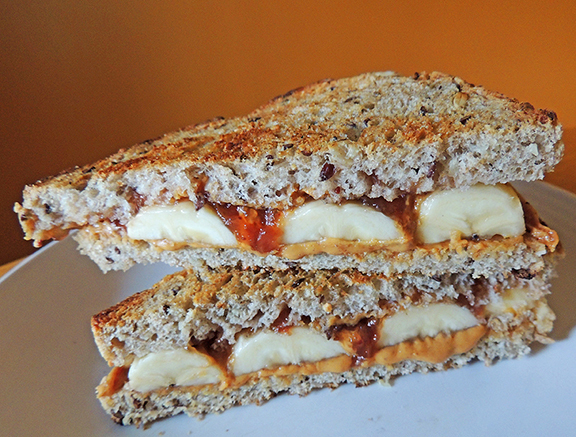 Spread the slices with peanut butter and top with the banana slices. Spread the remaining slices with jelly and put them, jelly side down, on top of the bananas. Press gently to flatten slightly. Heat a cast iron or heavy skillet over medium heat. Place sandwiches in skillet and cook, pressing lightly with a metal spatula, until the bread is browned, about 3 minutes. Gently flip sandwich over and cook for another 3 minutes or until golden. Serve immediately.